This was good. Really good. I have had this book for years but for some reason, I never got around to reading it. I should not have waited so long because this book is fantastic. I was hooked by this story right away and there was never a dull moment. I listened to this book every spare moment that I could find and really enjoyed the experience. I probably read this book's summary back when it was released but I went into this book with no idea what it was about. Based on the title, I thought it was about a fireman. There is a fireman in the book but this story is really about a whole lot more than that. This story follows Harper, a nurse, as the world tries to deal with the new outbreak everyone is calling Dragonscale. People with Dragonscale seem to spontaneously burst into flames killing themselves and endangering those around them. I do enjoy a good end of the world story and I appreciated the fact that this one is a little different than anything I have read before. The Dragonscale is dangerous and people are scared and some are taking things into their own hands. When Harper is infected, she must fight for her life and ends up finding her way to a community filled with others like her. She doesn't do it alone though. She has help from the fireman. This book took me on quite the journey. At the start, I was really curious about this new illness and was kind of mesmerized by how it was described. I loved seeing how the world was dealing with the situation at the hospital and in the world. I understood Harper's need to survive and keep going. The community she found was fantastic until it wasn't. I found the community's changing dynamics to be very well done. There was plenty of action and things that really couldn't be explained that kept the story really interesting. Kate Mulgrew did a fantastic job with the narration of this book. She was able to handle a large cast of characters incredibly well. Each character had a very distinctive voice and I felt a lot of emotion in her reading. She has a very pleasant voice and I thought that she read the story at a perfect pace. I found this book easy to listen to for hours at a time. I think that her performance increased my enjoyment of the novel. I would recommend this book to others. This was an epic story filled with great characters and a lot of excitement. I am so glad that I finally decided to pick this one up and cannot wait to read more of Joe Hill's work. I received a digital review copy of this book from William Morrow via Edelweiss and borrowed a copy of the audiobook from my local library via Hoopla. 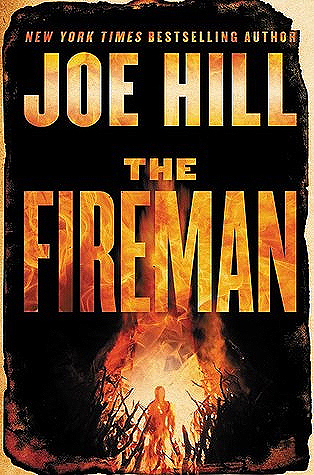 The Fireman looks to be an intense dystopia story and I am excited to read it from the synopsis and your review. The title had me imagining it would be a romantic story! I really had no idead what to expect so it was a rather nice surprise. I have been hearing so much about Joe Hill. I am adding this to my wishlist. I have read two of his books in just the past couple of months and really enjoyed them both. I hope you enjoy this one if you get the chance to read it, Nadene! I enjoyed Heart Shaped Box and I do have this one but the size of the book puts me right off at the moment! It is a longer book but I feel like I still was able to get through it quickly. I can read 1,000 pages in a couple of days if it is really good or I can take a week to read 300 pages when it isn't so good. I try not to let length put me off but I know it does at times. I can't believe I've not read this but I have a bad aversion to it. When Cass and Booker T got in a fight several years ago, this book was on the table and ended up on the floor and I'm sure there is traces of Booker T's blood on it (TMI I'm sure). I don't know if I'll ever be able to pick it up. Maybe I should read it and put the whole incident behind me for once and for all huh? I totally understand, Barb! I remember how traumatic that was and I must tell you that your story is the reason that two of my dogs are put in a crate whenever we leave the house. They don't mind their crate and I know that they are safe. I liked this one. Several of my friends didn't and that made me most curious to read it. I wonder if the audible would be even better. Kate Mulgrew does such a great job with the narration that I do feel it added to the overall experience. Yay! I’m glad it was good and exciting. I swear I’ll read a Joe Hill book someday. They sound like books I’d love. Great review! I hope you do get the chance to read some of Joe Hill's work soon, AJ! I am enjoying his work lately. I hope you get the chance to read him soon. Oh that does sound different and one that I would enjoy. It was very well done, Mary! I need to check if my library has it! I do recommend going with the audiobook if you get the chance! I thought it was a really well told story, Anne. The narration was really top notch as well. This is the second Joe Hill review I've read recently and I'm so intrigued with his stories. They are extremely original. "To Jakob’s dismay, Harper wants to live" - excuse you? I'm assuming if one person got infected they would kill themselves? Idk. I'm deeply horrified with this disease. Last year I burned my hands with boiling water and have never felt something more terrifying and excruciating. The inside of my hands felt like they were literally on fire. However, this seems too cool to pass up. It's also a book I think my brother would love. I might give it as a gift for him on his birthday or next Christmas. Ouch! I hope your hands are better. Joe Hill did a really great job with this one and I think it would make a great gift. Hoopla has most of Hill's work and I plan to take avantage of it! I have read two of his books just recently. I am having a great time with his work. I actually just read NOS4A2 about a month ago. Glad you enjoyed your re-read of it! I loved this book too. I wasn't sure that I would when I first saw it, but it blew me away. It is my second favorite Joe Hill book (it will be really hard to beat NOS4A2). I actually liked this one a bit more than NOS4A2 but they were both excellent and I loved Kate Mulgrew's narration on both.